After launching Galaxy Note 5, Samsung has come up with Galaxy Note 7 instead Galaxy Note 6. It seems that Samsung wants some kind of similarity at least in the names of its latest premium handsets. Unlike the previous launches like Galaxy S7 and S7 Edge, Galaxy Note 7 comes with a broader display and yet another handful features. Samsung Galaxy Note 7 measures to be 153.5*73.9*7.9mm. It is light weighted with just 169 grams. The back panel is made of Corning Gorilla Glass 5, which gives it an elegant and magnificent look. Galaxy Note 7 has a display that extends upto 5.7 inches edge to edge. It also has a screen resolution of 1440*2560 pixels with 518 Pixel Density. The AMOLED Capacitive Touchscreen is protected by Corning Gorilla Glass 5 which will avoid potential cracks that may happen due to accidental falls. 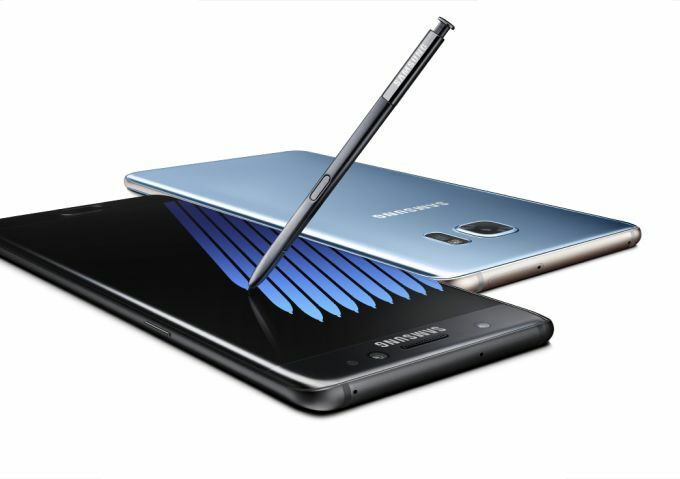 Galaxy Note 7 is powered by Quad Core Qualcomm Snapdragon processor in US. In other markets Galaxy Note 7 will be powered by 64-bit Octa Core processor, may be Exynos 8890. This chipset consists of Quad Core Mongoose clocking 2.3GHz and Quad Core Cortex A53 clocking 1.6GHz. This handset is supported with a RAM of 4GB along with an internal storage of 64GB. This storage can be extended upto 256GB with the help of external microSD memory card. Graphics support is also granted by Mali T880 MP12. Galaxy Note 7 runs on Android OS v6.0.1 Marshmallow which is possible expected to upgrade to latest V7.0 Nougat. Samsung handsets usually have excellent snappers. Galaxy Note 7 too has excellent cameras to its back and front. The main snapper is having 12MP lens with additional features like Phase Detection, Optical Image Stabilization, Dual Tone LED Flash and an aperture of f/1.7. This snapper can record 4K video. The front cam has 5MP lens with the support of an aperture of f/1.7. It also supports Dual Video Call. Galaxy Note 7 is IP68 certified which means it is water proof as well as dust proof. It can resist water to a depth of 1.5 meters for upto 30 minutes. This will provide protection to internal components of handset from small drops of water and other wetting. The S-Pen is something unique. It can translate words just by tapping it with S-pen. S-Pen can also be used underwater and also when display fails to identify the touch of your fingers. Galaxy Note 7 supports WiFi connectivity with 802.11a/b/g/n/ac. It also supports Bluetooth with a v4.2 along with GPS connectivity with A-GPS. Galaxy Note 7 also supports USB of v3.1 featured with Type-C 1.0 Reversible Connector. It also accommodated sensors like Iris Scanner, Gyro, Fingerprint, Barometer, Proximity, Accelerometer, Compass, SpO2 and Heart Rate. Galaxy Note 7 is kept alive with the help of Non-Removable Li-Po battery with a capacity of 3500mAh. With the help of Fast Charging technique this battery can be charged to full within an hour or less. Depending on the market, Galaxy Note 7 also supports Qi Wireless Charging also. Galaxy Note 7 is available in colour variants like Blue Coral, Silver Titanium, Gold Platinum and Black Onyx. It will be available in American markets from August 19th onwards. But unfortunately the pricing details are unavailable.